What a curious thing the stock market is; so powerful, yet so flighty. Like a school of sardines, it moves as one, changing direction nimbly when danger looms or advantage beckons. What it will do next has always been difficult to predict. But what if you could now – using nothing more than a free, public online tool? These warning signs in search volume data could have been exploited in the construction of profitable trading strategies. Stock market prediction is so difficult, says Warwick Business School researcher and first author Tobias Preis, due to “herding behaviour”. Investors are influenced by the collective thinking of others in the market, as well as their own personal reasons, so trading patterns in one week are nearly useless for predicting what will happen the following week. Knowledge is power … and may be highly profitable. To predict the market, Preis says, you need to know what is going through people’s minds before they make their financial decisions – and one way to do this is to see the words they Google. Data mining tools such as Google Trends and Google Correlate are putting powerful analytical toolkits into the hands of investors keen to parlay a small advantage into a large gain. As a point in principle, the price of stock in Apple Inc. is seen to positively correlate with search volume, in this recent article from the Harvard Business School. Twitter feeds are also showing promise as sources of strategic investor information. 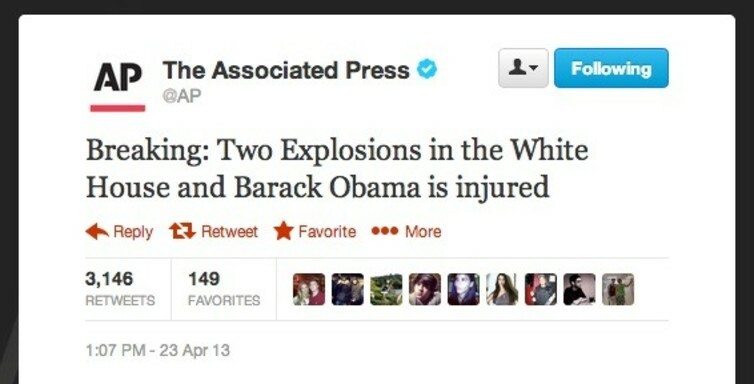 This was demonstrated in spectacular form on Tuesday when the hacked Associated Press Twitter account reported two explosions in the White House with US President Barack Obama injured. Associated Press immediately corrected the tweet, but the Dow Jones Industrial Average dropped 143 points in a “flash crash”. And while the market recovered within minutes, the crash showed just how intertwined Twitter and the stock market are. Previous work by German economists Dimpfl and Jank looked at whether internet search queries could predict stock market volatility. They concluded that daily search query data gives clear insight into people’s interest in the market as a whole. Investors are more active with their queries during times of strong market movement. Like Preis, they found a rise in investor attention is followed by a period of heightened market volatility. Query volumes anticipate in many cases peaks of trading by one day or more. In other words, there is a correlation between trading volumes of NASDAQ-100 stocks and the volumes of queries related to the same stocks. The advantage of using real-time data analytics is, of course, that it tells you what is happening right now. Google Trends … provide a real time report on query volume, while economic data is typically released several days after the close of the month. Given this time lag, it is not implausible that Google queries in a category like “Automotive/Vehicle Shopping” during the first few weeks of March may help predict what actual March automotive sales will be like when the official data is released halfway through April. 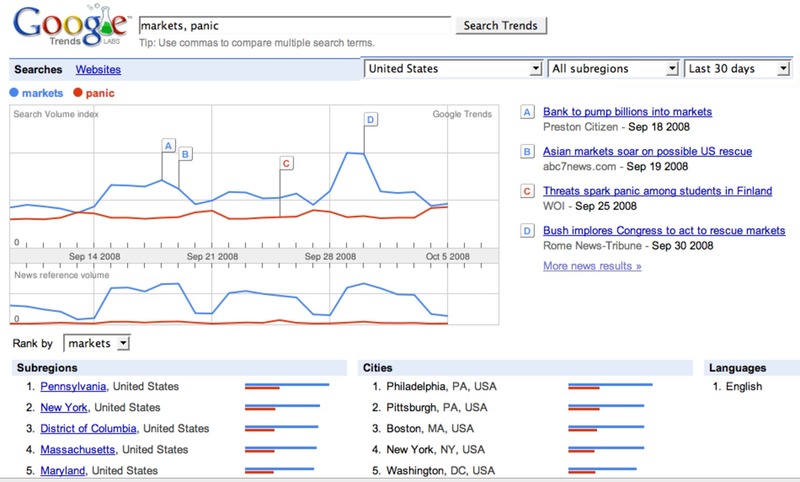 This work is detailed in the paper Predicting the Present with Google Trends. So how do I make my millions? The work done so far indicates that using tools such as Google Trends and Yahoo! can yield real-time insight into market sentiment, and that this information can be used strategically to devise profitable trading strategies. What is needed, though, is finer granularity. If investors could drill down further into the data to discern daily or hourly trends they might well be able to predict a rise or fall in stock prices. It could also give people warning of impending crises. With increasing volumes of data on the internet, there is a clear need for tools that can mine this data and be a window into the zeitgeist. Google Trends, with its access to search data from the most popular search engine, is probably the most powerful such tool currently available. And if you’re looking for a safe bet, it is highly likely we will see a lot more action in this field in the years ahead.